JooTube.TV: How is this Passover similar to other historic Passovers? How is this Passover similar to other historic Passovers? Frazier Glenn Miller of Aurora, Missouri, was arrested in the slayings of 3 people he thought to be Jewish, in his shootings at a Jewish community center and retirement community in Overland Park, Kansas. Physician, Dr. William Lewis Corporon and his grandson, 14-year-old Eagle Scout, Reat Griffin Underwood, died as a result of the injuries inflicted by Miller, a former Ku Klux Klan Grand Dragon, at the JCC where Reat was to sing in a talent competition. Grandfather and grandson were Methodists. The San Diego Jewish World reports: The Conference of Presidents of Major American Jewish Organizations extended its condolences to the families of the victims of the shootings outside of two facilities of the Jewish community in the Kansas City suburbs. It also noted that “the perpetrator is reported to have a history of both anti-Semitic and racist activities. It is a reminder of the dangers of homegrown terrorism and the threat posed by extremist organizations or individuals. Coming on the eve of Passover, it is particularly important that all community institutions take the proper steps to maximize security, but at the same time, people should not be dissuaded from attending communal events, services or programs. 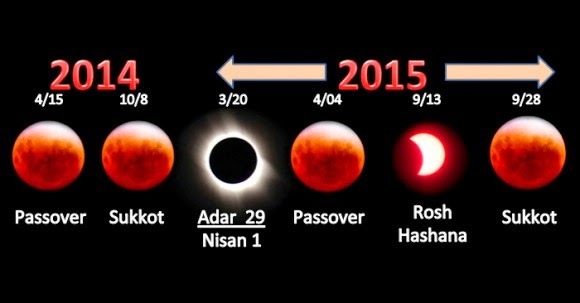 The scheduled appearance of four total lunar eclipses on major Jewish holidays between Monday night (the start of Passover 2014) and September 27, 2015 (the start of Sukkot) has the attention of much of the religious world. Pastor Mark Biltz, author of the book, "Blood Moons: Decoding of the Imminent, Heavenly Signs," explained to JooTube.TV why Israel and the gentile nations ought pay attention to those attempting to remove holy land from Jewish guardianship (such as activists and politicians supporting a Muslim nationalist movement in Palestine) surrounding these eclipses (particularly during the super-moon - which will be visible in Israel during Sukkot, 2015) which he writes could be indicators of war against Israel. The New York Police Department on Tuesday said it was preparing for possible terror activity aimed at disrupting the trial of Abu Hamza al-Masri, the firebrand preacher from North London’s Finsbury Park Mosque, who allegedly planned attacks against Jews. Ironically, his trial in Manhattan Federal Court begins on April 14th, the start of the Jewish holiday of Passover. The imam “helped radicalize dozens of individuals in both the U.K. and U.S. who went on to engage in terrorist acts,” Rebecca Weiner, director of intelligence analysis for the NYPD, told Jewish leaders at a pre-Passover briefing at police headquarters, according to the New York Daily News. NYPD Deputy Commissioner of Intelligence John Miller said police will be on high alert. The trial, which selected a jury on Monday, was recessed until Thursday in respect for those observing Passover.